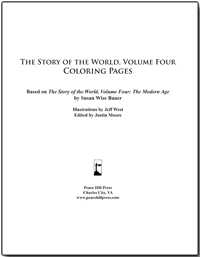 Illustrating the events of the past 150 years, these supplemental coloring pages accompany The Story of the World Vol. 4: The Modern Age, Text. Unlike the Activity Books for the other 3 volumes, The Story of the World Vol. 4: The Modern Age, Activity Book does not contain coloring pages. They were replaced with projects and activities designed for slightly older children. But some students wanted their collection of coloring pages to span the ages, so we put this optional set together for you! These 42 exciting and accurate illustrations were created by artist Jeff West, whose work for Well-Trained Mind Press can be seen in Who in the World Was the Acrobatic Empress? and in the revised editions of The Story of the World, Volumes 1 and 2. You are free to print as many copies of each coloring page as you want for use within your immediate family. Note: These are coloring pages ONLY; this set does NOT include any of the Student Pages for Volume 4. Are you looking to buy a complete set of extra Student Pages for Volume 4? Get them here! When I opened Volume 4 of Story of the World my kids were so sad to see the color pages had been taken out of the Activity book. Thank you for providing this as an additional resource. We appreciate it and look forward to listening and coloring together happily. We listen to Story of the World as a family and my PreK, kindergartener, and fourth grader color while they listen. We started Volume 4 yesterday and the first thing my kids commented on was the lack of coloring pages. I never knew how much they enjoyed them until they weren’t there anymore. So excited that this resource is available. My only wish is that it had been included with the Activity Pack that I already purchased (as in previous years) instead of charging more for this resource. Thanks for the feedback! We are glad that your kids enjoy the coloring pages. Since many users of Volume 4 are older, we often hear that they don’t need the coloring pages. But so many people DID request them that we ended up making this separate pack. We will consider your suggestion about combining them.